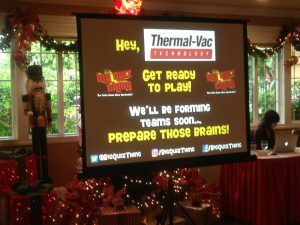 One of the many advantages of choosing a trivia show for your corporate event, team building exercise, or private party is that a decent quiz company will give you a unique, personalized product, every time. 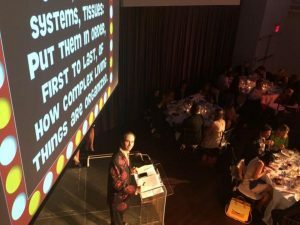 And we play up the customization aspect as something that sets the Big Quiz Thing apart, both from other companies that do corporate trivia events (some of which offer only a one-size-fits-all program) and different types of corporate team-building events. After all, in business service is key, and personalizing the actual content of our game show is a logical extension of that. Besides, we like people, so why not? Basic customization: This is the baseline, your standard “The guests are all in their twenties, so no puzzles about the Lindy Hop and Bing Crosby”—knowing your audience, in other words. Yes, it’s more challenging when the crowd goes to extremes, agewise: Not long ago, we hosted an event where the median age was well over 70, which severely cut down on the amount of appropriate material from our archives (though we enjoyed the challenge). In the opposite direction, with family events, we tend to tweak both format and content. (We’ve found that kids do a lot better with shorter game rounds.) Another consideration: Whether we need to keep the event completely PG-rated, or if we can drift toward the fringes of adult humor (something a rowdy audience often pushes us into). Advanced customization: An intermediate step. In cases such as these, the client will tell us specific topics that the guests are interested in, and we’ll draw from our archives accordingly. 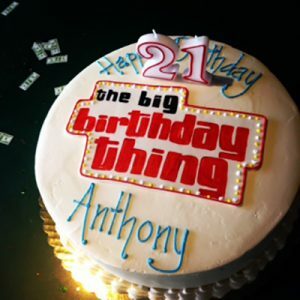 We once hosted a 21st-birthday party for a young man who definitely didn’t go with the 21-year-old flow; his interests included ballroom dancing, the golden age of Hollywood, and 1960s television. (We’d always wanted to test people on Mister Ed’s real name.) So while we wrote no brand-new questions specifically for this event, we couldn’t simply tweak a past program either. We’ll research the organization, the office, its employees, and its clients, with the advice and approval of our contact, and from that info we’ll craft BQT-style questions (and multimedia puzzles) just for them. (We find it best to sprinkle these throughout the game, rather than feature a dedicated round of company queries.) Occasionally, a group will even want the entire game, 100 percent, to consist of customized questions; now we’re talking a higher fee, but sometimes this is what the program demands, and we can make it happen. Meanwhile, for a private (non-corporate) client, the bespoke option means we’ll learn all about the guest(s) of honor via a unique questionnaire distributed to friends and relatives. Whether you want a full multimedia spectacular packed with clever, world-class trivia, or you need a complete, one-of-a-kind, never-to-be-repeated quiz show spectacular, the Big Quiz Thing is your source for all private and corporate events of the trivia variety. We’ve got hosts in San Francisco, New York, and Boston, and traveling is no problem. Contact us today and let’s get started.